Are you thinking about bringing home a papimo? Papimos are a mix of the American Eskimo dog and the papillon. They’re designer breeds, which means you can never be certain of what you’re going to get. Some papimos resemble their American Eskimo side more closely, while others take after their papillon parent. That also means papimos get a mix of their parents’ personality traits. They can often be quite friendly and have an abundance of energy, requiring a lot of exercise. With that said, you need to know more about the papillon x American Eskimo dog breed before making your decision. So, let’s take a look at some more information that could prove useful. The controversy surrounding designer dogs is never-ending. On one hand, there are purebred dog advocates who claim that designer dogs are inferior. On the other hand, there is evidence that designer dogs are actually better off than purebred dogs. Designer dogs are made by breeding two different purebred dogs. They are distinguished from mutts in that mutts are not born of two purebred parents. Instead, a mutt’s parents are most often two different mixed dogs. In reality, there’s an argument to be made for both purebred and designer dogs. The purebred dog camp prefers them because of their predictability. When you breed a purebred dog, you know what you’re going to get in regard to both personality and appearance. But because of their limited gene pool, they do get sick more often. Purebred dogs suffer from something known as inbreed depression as the result of their small gene pool. This is known to cause numerous health problems and even reduce their life spans. But when we look at designer dogs, we don’t see this problem. This is thanks to the variety of genes they possess, which protects them from health complications that arise from inbreeding. In fact, designer dogs live longer than purebred dogs. However, some criticisms that have been raised about designer dogs include them being overpriced, coming from puppy mills and having questionable upbringings. The papimo is a designer dog bred from the papillon and the American Eskimo dog. There isn’t much known about its origins, though we do know that it first appeared in the United States. To better understand the breed, we need to take a look at its parents’ origins. Papillons originated in Europe and were the favorites of noblewomen. Many royal ladies can be seen in portraits with a papillon on their laps. Spaniels were crossed with toy breeds in the Renaissance era to make the lapillon to appease the nobles desire for miniaturized dogs. The breed is strongly connected to France, with the famed Marie Antoinette having a pet papillon named Thisbe. However, it was popularized in Italy and Spain. The American Kennel Club first recognized the Papillon in 1915. Many people think that the Eskimos had something to do with the origins of the American Eskimo, but the name is a misnomer. In the early 1800s, Germans immigrated to America and brought with them the German spitz. Back then, they were used for farming, but that didn’t last long. In the 19th and 20th century, the German spitz joined the traveling circus, using its intelligence and agility to perform in trained-dog acts. But in World War I, the breed was renamed to combat the prejudices against Germans. Hence, the American Eskimo dog. The American Eskimo was registered by the American Kennel Club in 1995. Let’s take a look at what you get when you cross these different breeds. As mentioned, designer dogs get their traits from their parents. Adult papimos weigh between 8 to 15 pounds, with the exact weight varying. Papimos are quite small, between 8 to 12 inches tall. Because of its parents, the papimo can be either a toy size or be considered a small dog. The American Eskimo dog can be quite big, with the standard being around 30 pounds and the toy size being 6. As you can see, there are a lot of factors that come into play. Papimos are defined by their small size. They’re usually white with covered tan spots on their backs, and their fur is medium-length. American Eskimo dogs and papillons are both friendly, playful breeds, so the likelihood that a papimo will be the same is quite high. Because papillons are related to spaniels, the papimo can be quite athletic when compared to other toy dog breeds. Papimos also take after their parents in that they are usually quite friendly, getting along with their families and other animals quite well, though their Eskimo nature can cause them to be shy around new people. Like other mixed breeds, papimos’ temperament will vary depending on which side they take after. 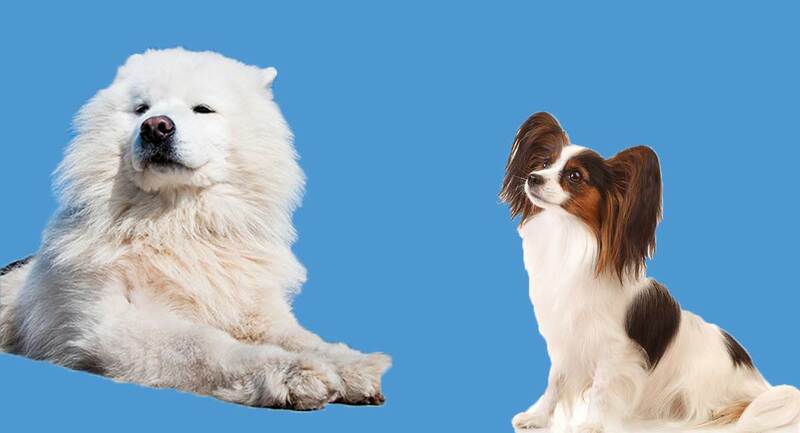 Because both the papillon and the American Eskimo dog are friendly and intelligent, the odds that the papillon will turn out that way are quite high. With that said, papimos do need to be exposed to people and other animals if they will be in the household. They can be quite shy around new people, and strangers make them nervous. But once they get to know someone, they become affectionate. They can get along well with other pets in the family, as long as they’re introduced properly. Papimos, while small in size, are quite active and need ample amounts of exercise. Their parents, especially the papillon, are energetic breeds. To thrive, the papimo needs at least 45 minutes of activity every day. Aside from going on walks, the Papimo needs to get in some play time, either outside in a fenced-in yard or inside with toys. Like any dog, training is an important part of ensuring your papimo stays healthy and safe. Positive reinforcement training can allow the dog to get out of its energy productively. The papimo’s coat is medium in length, though the fur does grow longer on their chest, tail, elbows and face. Their fur is predominantly white, so they do need extra special attention to keep their fur looking fresh. Both of the papimo’s parents shed a lot, and the papimo takes after that. They need to be brushed frequently, with a recommendation of twice a week to keep their coats clean and shedding in check. Aside from regular brushing, the papimo would benefit from a visit to the dog groomer on occasion. To determine the health issues that a papimo faces, we need to take a look at its parents. Papillons have a few health problems that you need to watch out for. The first is that they are prone to vision loss. It’s been found that papillons experience retinal degeneration, which is hereditary. It has a chance of being passed down to a papillon’s litter. This is unfortunate, as it usually results in blindness. And it often doesn’t present itself until later in life. The other parent, the American Eskimo dog, is unfortunately also affected by retinal atrophy. With that said, the papimo will not always carry on this condition, but there is a chance, especially if the parent shows signs. Another health issue that both parents share is luxating patella, which means that the kneecap moves out of its normal location. This is something that should also be taken into consideration. The ideal home for a papimo is one where they will get a lot of attention. Papimos, like other small dog breeds, love to play. They need a family that will put in the time to take them for walks and train them accordingly. Both the papillon and the American Eskimo dog are good with other dogs and cats if introduced at a young age. However, small animals like birds and rabbits should be kept away from the papimo. Because they can be cautious around new people, make sure to socialize them well. And when it comes to kids, be cautious. The American Eskimo dog does very well with kids, though the papillon can be overwhelmed by the rough play that small children sometimes enjoy. Your papimo may show either tendency. The most important part of picking your papimo is ensuring that she is raised in a loving, healthy home. This way, you can be sure that she is physically healthy and not being mistreated. If you can, visit the breeder. Make sure to ask them all of the questions you have before taking your papimo home. And keep in mind that a good breeder will also be asking you questions to make sure you’re a good fit for their puppy. If possible, meet the puppy’s mother and father. They should have been tested recently for health conditions that could be passed down to the litter. With that said, take a look at the entire litter to make sure they’re healthy. Before finally picking your papimo, ensure that they have been thoroughly examined by a certified veterinarian and are up to date with their treatments, including deworming and the first set of vaccinations. Is a Papimo Right for Me? Do you find the American Eskimo Papillon mix cute? Are you ready and willing to give your dog a lot of love and exercise? If so, maybe you’ll soon be adding a papimo into the family.